Make your holiday shopping twice as meaningful this season by choosing gifts from the Pack for a Purpose Shop. When you make purchases through any of the avenues below, you also support Pack for a Purpose, helping us continue to make a Big Impact in local communities around the world. This year, we proudly launched our Pack for a Purpose collection on SpokenCloth. You can gift T-shirts, totes, pullovers and more to your favorite travelers and inspire them to Pack for a Purpose on their next trip. Know someone who has already Packed for a Purpose? You can customize their T-shirt so they can take pride in their tee-rific generosity and help spread the word! Even if they’re only traveling to the market or the mall, one of our hoodies or pullovers will make their trip both meaningful and cozy. Still shopping for holiday cards? Place your order through CardsforCauses.com and you can donate 20% of the cost to Pack for a Purpose. Just choose Pack for a Purpose as your cause of choice under the International category. All your Amazon purchases can directly benefit Pack for a Purpose when you use AmazonSmile and select Pack for a Purpose Inc. as your charity of choice. Make your purchases more meaningful all year long! 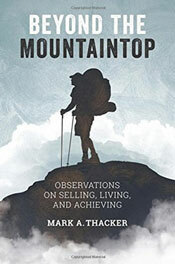 Inspire your loved ones with “Beyond the Mountaintop,” a story about overcoming obstacles with observations about selling, living, and achieving. 100% of the proceeds are shared between Pack for a Purpose and Make a Difference, an organization that supports an orphanage in Tanzania which is also the project supported by our participant Bristol Cottages. Still searching for the perfect gift for the travelers in your life? Visit the Pack for a Purpose eBay page for ideas. 100% of the proceeds will benefit Pack for a Purpose. Whether you’re shopping for the traveler, bookworm, or anyone else in your life, you can make Pack for a Purpose a part of your holiday giving. Pack for a Purpose always appreciates your generosity and support, and we hope you have a joyous holiday!